This Christmas will be the first Christmas that Mike and I have spent together since we started seeing each other five years ago. This is also the first Christmas that I won't be going home to Vancouver Island and the first Christmas that I won't be seeing my parents and my brother when I get up on Christmas morning. That was a lot of Christmases. Not seeing my family is going to be hard, and I've been warning people for awhile now that I could be cranky because of it. But despite my sadness, I'm also excited to build new traditions with that lanky guy that will soon be my husband. Although I guess they mostly won't be new - more than likely they'll be adapted from what each of us did growing up with our own families, and we'll squish them and mold them them into something that works for us. The most important (to me) tradition that I'm bringing to the table is about the tree. It must be real, and we must go and cut it down ourselves. 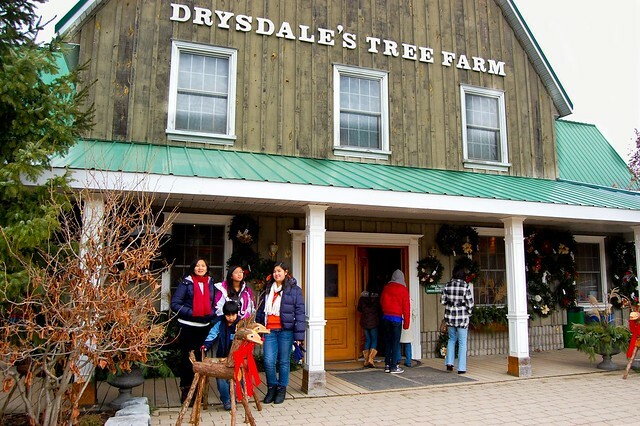 We're hitting up Drysdale's Tree Farm next weekend to go pick ours out. Tass gets to come too! It's a whole family affair. Drysdale's Christmas Tree Farm in Essa, Ontario via J-K Wong on Flickr. So far from Mike's side of things we've got the nativity scene. His grandma who just recently passed away always gave each couple a different nativity scene, and we got ours just a few days before she passed away. My family doesn't do nativity scenes, so this is new for me! The set we were given is beautiful stained glass; watch for pictures coming soon. If/when we add to our family, I'm sure the traditions that we start this year will evolve even more. We'll watch a favourite movie, read a favourite book, eat a favourite breakfast, develop our "go to" stocking stuffers. Change is good - I can't wait. Pssssst! Who can tell me what movie that last quote is from?! What Christmas traditions do you have in your house?